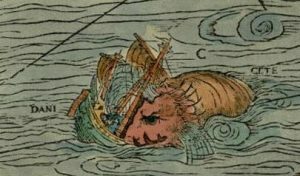 Detail from Olaus Magnus Carta Marina 1539: The ship-destroying sea monster is symbolising the perils of a journey across the open ocean. A Project on the Low German merchants’ trade from Bremen and Hamburg with the North Atlantic islands is not complete without the vessels that made trade across the ocean possible. The written sources tell us that many German ships were lost along the coast of Iceland, but until today, not a single mentioned shipwreck was found. This is not surprising, given the circumstance that underwater archaeology in Iceland is not even twenty years old. The saying “Searching for a needle in a haystack” is fitting pretty well to the search for shipwrecks mentioned in historical documents, considering the abilities to determine a ship’s position in the past and the fact that 71 % of Earth’s surface is covered by water. Even today, many ships vanish without a trace. On top of that, the number of archaeologists looking for certain shipwrecks is extremely low. Therefore, most shipwrecks are found by accident and they remain more or less anonymous. However, technology has improved and the potential for finding shipwrecks is much higher today than in the past. A number of devices can be used and combined for surveying the sea floor. A common combination is a side-scan sonar and a number of magnetometers, but this is still no guarantee for finding wrecks. When a ship is too decayed, or has settled into the sediment, the sound-rays of the side-scan sonar will not be able to produce a recognisable image. Moreover, magnetometers will not detect anomalies from the earth’s magnetic field when there is not enough metal on board the ship. Especially for medieval ships and early modern merchant vessels without guns, this can easily be the case. A sediment sonar could be a solution, which measures changes of density in the sediment with sound signals. The disadvantage is that waterlogged wood has the same density as waterlogged sediment. If a shipwreck has no denser cargo or ballast on board, the sonar will not detect density changes. Therefore such ships will remain hidden, even if an area is surveyed. Divers might be suggested as a final solution but a diver’s operating range is very limited, as he/she depends on depth, weather conditions, visibility and air supply. 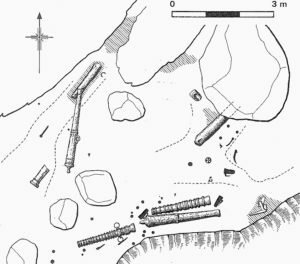 The fact is that archaeologists rely in most cases on coincidences, which is how most of the known shipwrecks were found. The reason for this is that many other professions like builders, fishermen, geologists etc. spend much more time working on the sea floor than archaeologists, and sometimes stumble upon a wreck. One famous example for this is for example the “Bremen Cog” in the German Maritime Museum in Bremerhaven. A suction-excavator operator found it in the river Weser close to Bremen, when he was working on an extension of the riverbed. It became one of the most important finds in ship archaeology. 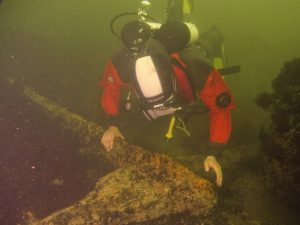 Over the past decades, since underwater became an area of archaeological interest, hundreds of shipwrecks have been registered by the heritage departments of the German federal states but only a few of them could be identified by historical documents. The author examining an anchor off the west coast of Gotland, at the site of the Visby-Disaster of 1566 (Photo: Jens Auer). When we approach the shipwrecks from the historical documents, we have to realize that mentioned positions for lost ships are most of the time very vague. This situation can extend the search area dramatically without even knowing if the wrecks still exist as a coherent site. The conditions of the natural environment are vital to the survival of remains. 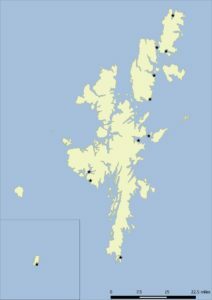 Rugged coastlines, strong currents, micro-organisms, the chemical consistence of the water and the like can severely contribute to the decay of organic matter, metals and even certain types of stone. In the Mediterranean Sea, for example, ship hulls will not survive for a long time above the sea floor due to temperature, salinity and micro-organisms. Iron will soon vanish by the reaction with salt and oxygen and even marble and copper-alloys will decay. The opposite situation can be found in the Northern Baltic or the Sea Black Sea, for example. The Northern Baltic is deep, has a very low salt content and is cold. This prevents wood-decaying organisms to multiply and destruction from anchors or looting divers. The Black Sea water, on the other hand, has hardly any oxygen in a certain depth, which almost freezes time on the sea floor. In addition, the circumstances of the sinking in connection to the natural environment play an important role. A German ship in Spanish service in 1588, the Gran Grifon, hardly left any structural remains. Another extreme example is the destruction of a united navy fleet of Lübeck and Danish ships during the Nordic Seven Years War on the west coast of Gotland in 1566. Out of thirty-seven ships, fifteen were lost and 6000 to 8000 sailors lost their lives in the so-called Visby-Disaster. Intensive archaeological diving surveys for several years could not reveal any wreck site. The ships literally vanished, most likely because they disintegrated in the storm on the rough sea floor and their remains were thrown up on the beach. These examples shows us that a sunken ship mentioned in the historical documents does not always leave a proper wreck site. 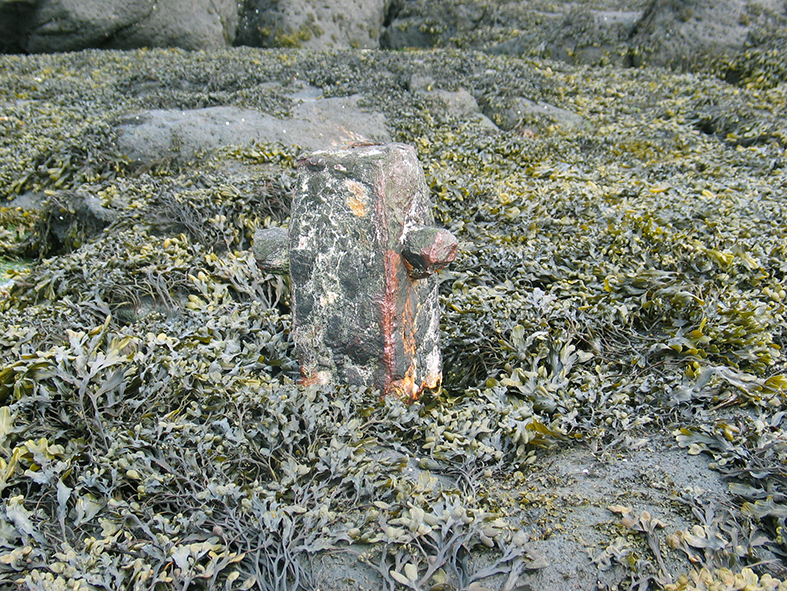 Sometimes scattered debris spread over square kilometres of sea floor can be all that is left of a ship. The site of the Bremen trading harbour Búðir/Bodenstede on the west coast of Iceland. It continued to be used by the Danes after 1601. In theory, Iceland has a high potential for finding shipwrecks. Since the late 9th century, humans settle here and they had no other way than to cross the rough North Atlantic Ocean and make landfall on a rugged coast. Many ships, Norwegian, Danish, English, Low German and Dutch, evidently got lost on their route between continental Europe and Iceland. A considerable number of these found their end on the coast of Iceland, as we can read in the historical documents. Ragnar Edvardson has calculated a number of about 450 shipwrecks in Iceland, from the period from 1100 to 1900, most of which foundered on the West coast. 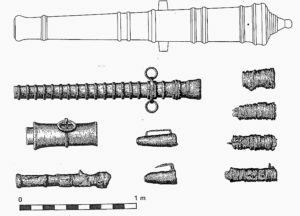 Until today, no wreck from the period of the Low German trade has been found. 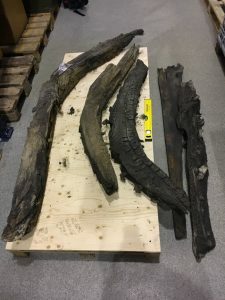 The oldest ship found in Iceland is currently a Dutch merchantman, which sank in the harbour at Flatey in Breiðafjörður in 1659, and is currently under investigation by Kevin Martin. The scarcity of known shipwrecks in Iceland is not necessarily because they vanished completely, but because maritime archaeology is a very young discipline in this country and started only with sporadic projects from 1993 onwards. 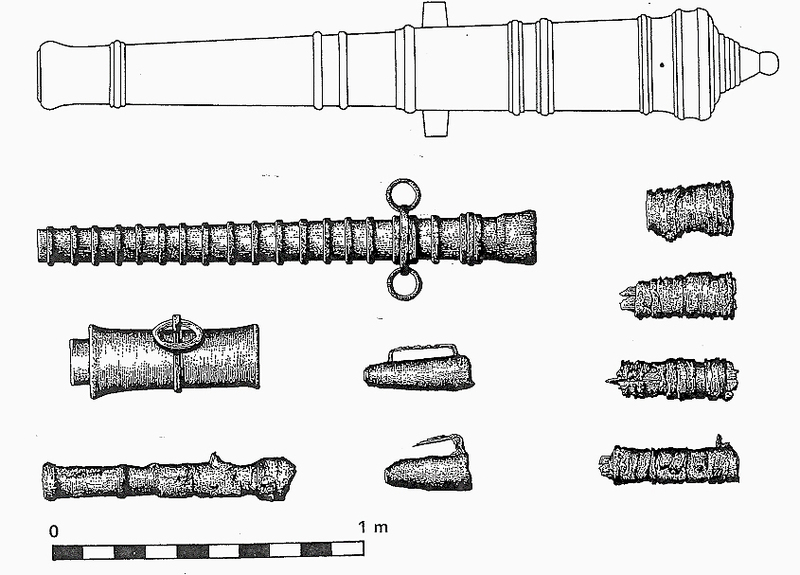 The relatively few inhabitants of Iceland also reduce the possibility of coincidental discoveries of wrecks due to the lack of building activities. However, coincidences happen – even in Iceland. In 1998, an excavator hit timbers while digging a cable trench near Búðir on the Snæfellsnes peninsula in Western Iceland. They turned out to be fragments of a ship that was buried under the sand of an estuary. 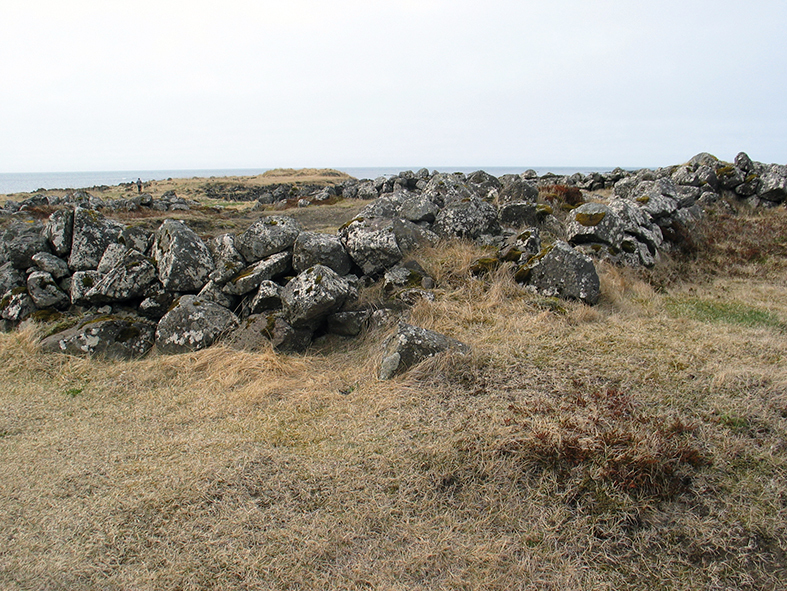 Some timbers and ballast stones were recovered by archaeologist Björn Stefánsson, and brought to the National Museum of Iceland in Reykjavik, were they were documented and put in storage. 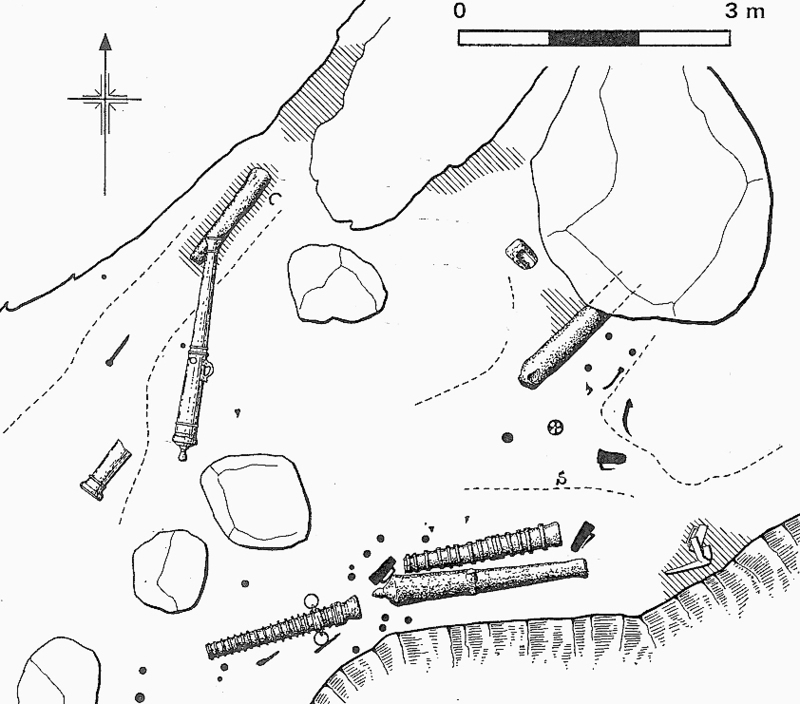 None of the recovered timbers was suitable for dendrochronological dating, but the ballast included stones that can possibly originate in Norway, Britain or Greenland. However, this does not give any indication were the ship was coming from, because ballast was taken from board and loaded in all harbours depending on the cargo and to adjust the angle of the ship in the water, to trim the ship. The recovered timbers give the impression of an old carvel-built ship. The material seems not to be of the finest quality, but this is hard to judge from only a handful of timbers. 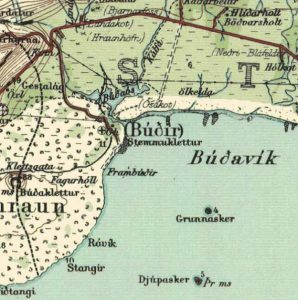 A promising fact is that Búðir was an important trading centre in Iceland for at least 200 years. It was already visited by Bremen merchants in the late 16th century, who called it “Bodenstede”. 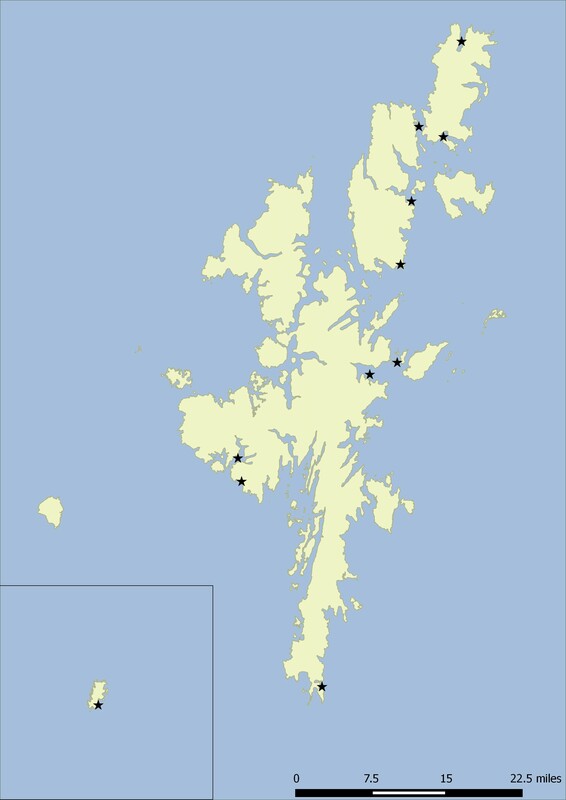 For a long time it was the main trading site for the Snæfellsness Peninsula, called first by cargo ships of the Low German merchants and later by Danish and Dutch ships. It was abandoned as a trading post in 1787. For this reason, we have written sources on the activities on this site including the loss of several ships during these 200 years. 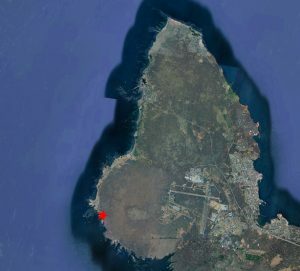 The problem for the identification of the accidental found ship is the fact that there was not only one ship lost near the site. 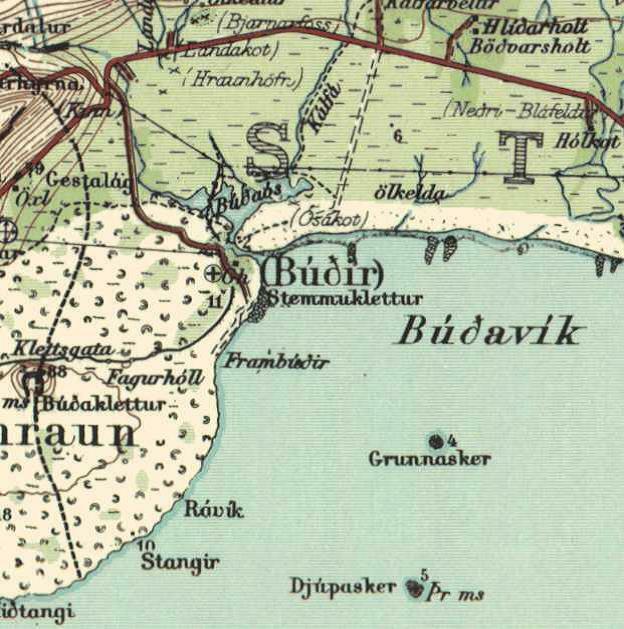 We know at least about eleven ships that are reported to have been lost at Búðir and its harbour Búðavik. Of those eleven ships, one was from Bremen. It belonged to the merchant Vasmer Bake and sank in or close to the harbour of Bodenstede in 1587. This was reported by Carsten Bake, his son, who himself was involved in the Iceland trade. 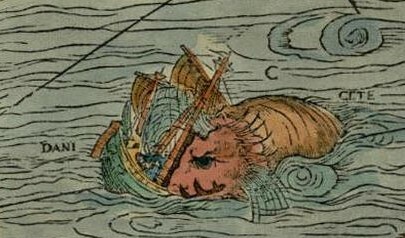 In 1607, a Danish ship wrecked at Búðir. For 1666, another ship sank west of Búðir. More ships sank in this area in 1724, 1728 (Danish) and 1754, and lastly, Bjarni Sívertsen’s cutter, which got lost here in 1812. 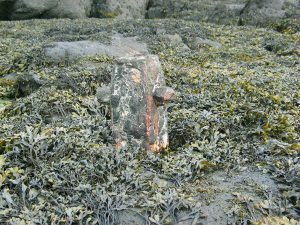 Certainly, it is possible that the ship found in 1998 is Vasmer Bake’s lost vessel from 1587, but the timbers cannot give us any more detailed information. All we can say today about the few recovered timbers is that there are five floor timbers and two fragments with an unknown function. The floor timbers indicate that the cable trench hit the wreck most likely in the bow section, leaving most of the buried remains uncovered. Each plank was attached to each frame with at least two tree nails, and each frame was connected to the keel with one or two tree nails. The dimensions of the floor timbers vary a lot, from flat and wide to high and narrow. This might be an indication that whoever built the ship faced either a shortage of crooked compass timbers, or the building did not rely on an even framing in a shell based building method, or both. However, it can also not be excluded that we face the remains of Bjarni Sívertsen’s cutter from 1812. Only future investigations might give us an answer. Edvardson R. and Grassel Ph., The Potential of Underwater Archaeology in the North Atlantic. In: N. Mehler, Travelling to Shetland, Faroe and Iceland during the 15th to 17th centuries (in press).